BUCK-TICK is a visual band with long history. 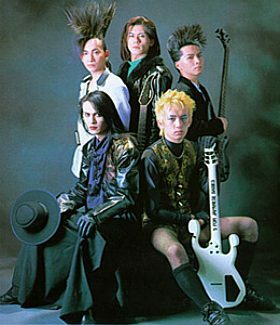 BUCK-TICK, which means "fire-cracker", was formed in late 1985. The members are Atsushi, Hisashi, Hidehiko (Hide), Yutaka (U-Ta) and Toll. They are famous but not as popular as some bands emerged out around the same days as them, probably their music style is not so poppish. They do have some pop stuff, as in their latest album "ONE LIFE, ONE DEATH". The members said they intend to make this album "a book which will be placed in the very front part of a bookstore instead of high on a shelf somewhere deep inside the bookstore". BUCK-TICK is releasing a live video "TOUR ONE LIFE, ONE DEATH FINAL" late March next year, which will be a recording of their tour final at budokan on 12.29. Also, Atsushi and Hisashi will have a foreign project "SCHWEIN". Members include Atsushi, Hisashi, Pig's Raymond Watts and MDFM's Sascha Konierzo. They will release an album in 20001 spring, which will be available in Japan and America. They will also have live tours. BUCK-TICK is now under BMG FUNHOUSE label and new single "GLAMOROUS", their first item under BMG, has been released on 9.6. The new album "ONE LIFE, ONE DEATH", officially to be released on 9.20, is already available now. BUCK-TICK's contract with Mercury Records has ended, and they are moving to a new label. Mercury Records is going to release a B-T best album "97BT99" on 3.29. A little while ago, mass media spread a rumour that Atsushi was married lately, but this rumour was turned down by Atsushi himeself quickly.